Beth Ann & Jessica's Helpful Savings: 6PM: UGG Boots, Shoes, Accessories up to 70% Off! If you've been wanting your own pair of UGG boots for a while now, you can get them at great discounts from the trusted site 6pm! 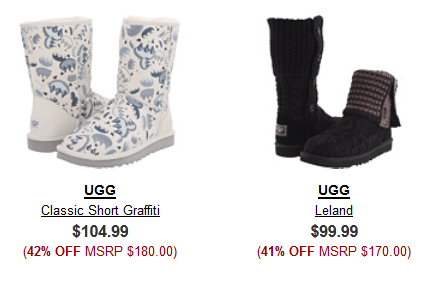 They've got UGG clothing, shoes and accessories up to 70% off. Shop through Shop at Home first and earn up to 6% cash back on your 6pm purchase!